Albert Whitman & Company, 9780807551448, 160pp. Sometimes kids’ lives can get busy and out of control, and worries can take over. When that happens, knowing how to pause and regain composure with mindfulness can help! 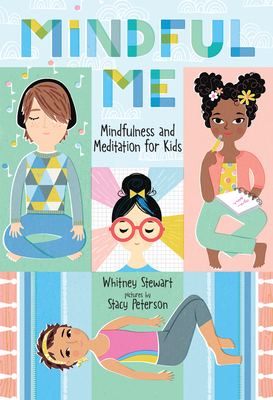 This easily digestible guide introduces kids to mindfulness as a way to find clarity, manage stress, handle difficult emotions, and navigate personal challenges. With step-by-step instructions to over thirty breathing, relaxation, and guided meditation exercises, readers will have an entire toolkit at their disposal and writing prompts will help them process their discoveries. Clearly written and incredibly relatable, this invaluable resource provides a positive introduction to the world of self-care and mindfulness. Whitney Stewart is a children’s book author, meditation teacher, and a born adventurer. She has traveled to Tibet, Nepal, and India and teaches mindfulness at Tulane University and to children and teens. Her most recent children's book is Meditation is an Open Sky: Mindfulness for Kids. She lives in Louisiana with her husband and son. Stacy Peterson is a full-time illustrator of greeting cards, magazines, and dozens of books including School RULES, Friends: Making Them & Keeping Them, and The Awesomest, Randomest Book Ever. Formerly, she was an art director at a New York City ad agency. She lives in Texas with her family.